Thank you for your interest in the REA Study Center! team at 833-639-8640 (Study Center support is option 4), or studycenter@rea.com. We'll resolve your issue within 24 hours on weekdays, or on the next business day on weekends. Q: What are the system requirements for the REA Study Center? A: All tests, quizzes, and flashcards available at REA's Study Center may be accessed using any internet-connected computer running any modern web-browser, including Internet Explorer (version 7 or higher), Safari, Chrome, and Firefox. Quizzes and tests also require the free Microsoft Silverlight plug-in to work. This is probably already installed on your computer, but if it isn't you'll have an opportunity to install it directly the first time you access the quizzes and tests. Flashcards may be accessed from your desktop or laptop computer, as well as any tablet or smartphone, including iPhone / iPad, Android, and Blackberry devices. Please note that when accessing your flashcards from a mobile device, data charges may apply. Q: How do I register for the REA Study Center? A: To register for REA's Study Center, visit www.rea.com/studycenter using any modern web-browser, including Internet Explorer (version 7 or higher), Safari, Chrome, or Firefox. To create an account, look for the words Need an account? Sign up. To complete your registration, enter your email address and choose a password, as shown below. While you're here, let us know what subjects you're interested in, and we'll add some free flashcards to your account. Q: How do I log in to the REA Study Center? A: To log in to REA's Study Center, visit www.rea.com/studycenter using any modern web-browser, including Internet Explorer (version 7 or higher), Safari, Chrome, or Firefox. If you've already created an account, enter the email address and password you chose when you registered, and click LOGIN, as shown below. If you haven't created an account yet, look for the words Need an account? Sign up as shown above. Q: Where can I find my access code? A: If you purchased a book that includes an access code, you will find it printed beneath a peel-off sticker located on the inside front cover of your book as shown below, or on a media card bound into the back of your book. If you purchased a digital product on REA.com, you will receive two emails. The first will be an order confirmation, and the second will contain your access code. These will be emailed to you within a few minutes of your purchase. If you don't receive your access code within a few minutes, check any Junk Mail or Spam folders to ensure that the email hasn't been mistakenly identified as spam. If, after checking these folders, you still do not have an access code email, please contact our Customer Support team at 833-639-8640, or studycenter@rea.com. Q: Where do I redeem my access code? 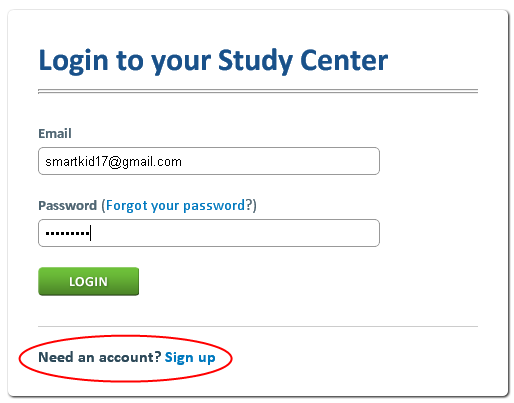 A: To redeem your access code, visit www.rea.com/studycenter, if you already have an account, log in and click the REDEEM CODES link in the upper right of your screen. If you don't have an account yet, you'll need to register first. Q: I have registered and redeemed my access code. How soon can I start studying? A: Right away! It's never too early to start studying, and your study tools will be available immediately after redeeming your access code. Click the Dashboard link to view the study tools that are currently in your account. Q: Can I share my access code with a friend or roommate? A: Each access code may be redeemed one time. If you think your friend would benefit from REA's prep products, please feel free to send them a link to www.rea.com/studycenter, where they can get their own access code! Q: Does my access code expire? A: Yes. For AP products, access codes are valid for one testing season, so your access code will expire on the next August 1st after you registered your book or digital product. For non-AP products, your access code is valid for one year from the date of registration. Q: I bought a used book. How can I access my quizzes, tests, and flashcards? A: If you purchased a used book, chances are that your access code has already been redeemed. You're welcome log in (or register if you don't already have an account) at www.rea.com/studycenter and to try using the REDEEM CODES link, just in case it hasn't. If you attempt to redeem an access code that has already been registered, the system will inform you that your access code has not been accepted. However, you may purchase a new access code by clicking on the STORE link in the upper right of your screen, and navigating to the test you're preparing for to purchase the digital content for that exam. A: To change your password, click the MY ACCOUNT button in the upper right of your screen. Q: I forgot my password. How can I recover it? A: If you've forgotten your password, click the Forgot Password link on the login page. Enter the email address you used to register, and click the Restore Password button. A new password will be emailed to you within a few minutes. Once you've successfully logged in using your new password, we recommend clicking the MY ACCOUNT link and changing your password to something more memorable. Q: What is the Dashboard? A: From the Dashboard, you can access all the study tools that are currently in your account. To view your Dashboard, make sure you're logged in, and click on the DASHBOARD link in the upper right of your screen. Q: Can I take my quizzes and practice tests on any computer, tablet, or smartphone? A: Your quizzes, mini-tests, and full-length practice tests may be accessed using any internet-connected computer running any modern web-browser, including Internet Explorer (version 7 or higher), Safari, Chrome, and Firefox. Q: How do I begin a quiz or practice test? A: To access any of the content available in REA's Study Center, click the DASHBOARD link in the upper right corner of your screen. Your Dashboard lists all of the study tools currently in your account, as well as additional material available for purchase. To begin, click the VIEW ALL CONTENT button to the right of the subject you're preparing for. This will expand the list of available content to show the TAKE QUIZ links, as shown below. Click on the Take Quiz link to access the testing system. Once you've reached the testing system, the first page you'll see is a brief tutorial screen, showing how the testing system works. 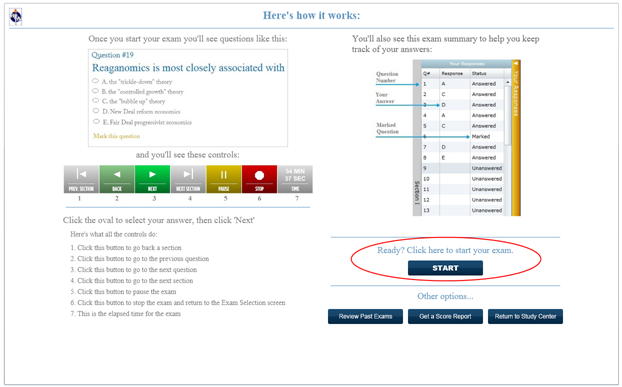 When you're ready to begin your quiz or test, click the START button in the lower right of your screen. 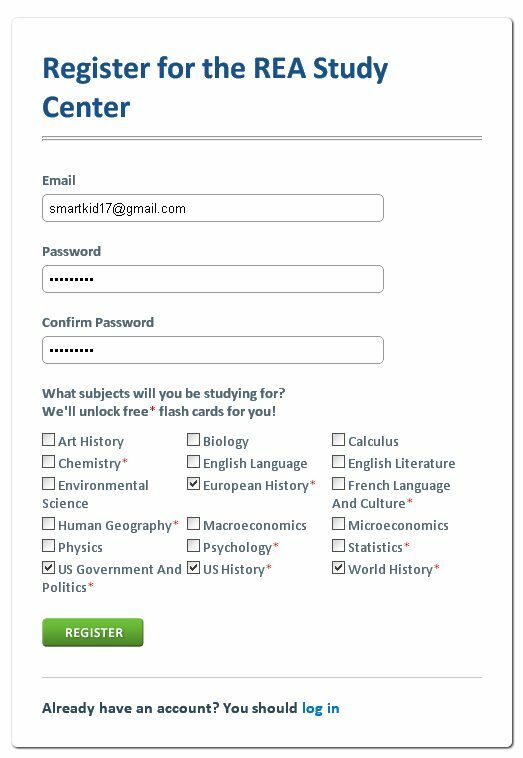 From this screen, you also have the option of reviewing quizzes and tests you've already completed, or returning to the Study Center. Q: How do I move from quiz to quiz? A: Once you've taken your first quiz and reviewed your score report, click the STOP button in the control panel near the bottom of your screen. This will return you to the How it Works screen you saw when you first accessed the test or quiz. From here, click on the Return to Study Center button to return to your Dashboard. From your Dashboard, you can access another quiz, test, or flashcard content. Q: Can I change an answer during a quiz or practice test? A: Yes. Simply click on the oval corresponding to your new answer choice. Your previous answer will be erased and your new answer will be recorded. When taking a full-length practice test, remember that (just like the actual exam) you can only change answers in your current section. Once you've completed a section and moved on to the next one, you will not be able to return to the completed section. Q: Can I start a quiz or practice test and finish it later? A: Yes. At any time during a quiz or practice test, click the STOP button to suspend your test and save your place. When you're ready to finish your exam, click on the appropriate Take Quiz link in the Study Center. When you return to the testing system, you will be offered the choice of resuming your test or quiz, or starting over from the beginning of that test or quiz. Q: Can I come back and review all my completed quizzes and practice tests? A: Yes. You can review past quizzes or practice tests at any time by clicking on the Score Report link for the appropriate subject in the Study Center. Clicking this link brings you to the testing system and displays the score report for your most recent exam. To view the score report for another exam, close the current score report and click STOP to return to the How it Works screen. Once you're on the How it Works screen, click the Review Past Exams button in the lower right of your screen. To review exams in another subject, click Return to Study Center and choose a score report link in the subject you would like to review. If you would like to review past exams in a different subject, click the Return to Study Center button, and choose the Score Report link in the appropriate subject and follow steps above. Q: Can I access my flashcards on any computer, tablet, or smartphone? A: Yes. Flashcards may be accessed on any internet-connected computer, tablet, or smartphone, including iPhone / iPad, Android, and Blackberry devices. Please note that when accessing your flashcards from a mobile device, data charges may apply. Q: How do I access my flashcards? A: To access your flashcards, login to REA's Study Center at www.rea.com/studycenter. When you log in, you will be taken directly to your Dashboard. 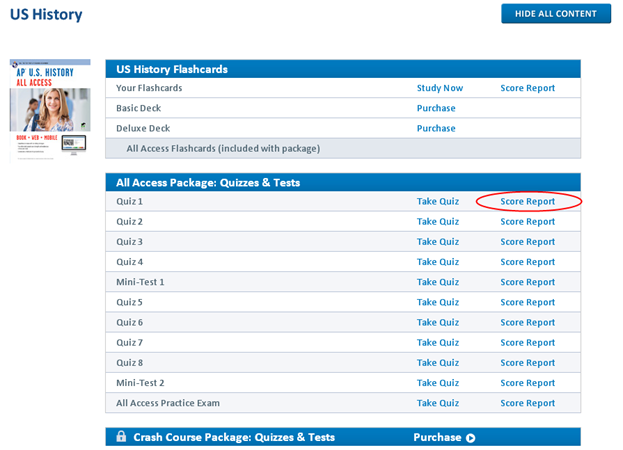 Click on the VIEW ALL CONTENT button, and then click Study Now next to the flashcards of your choice. Please note that if you have purchased multiple flashcard decks, you may choose your deck using the dropdown menu near the top of your screen. 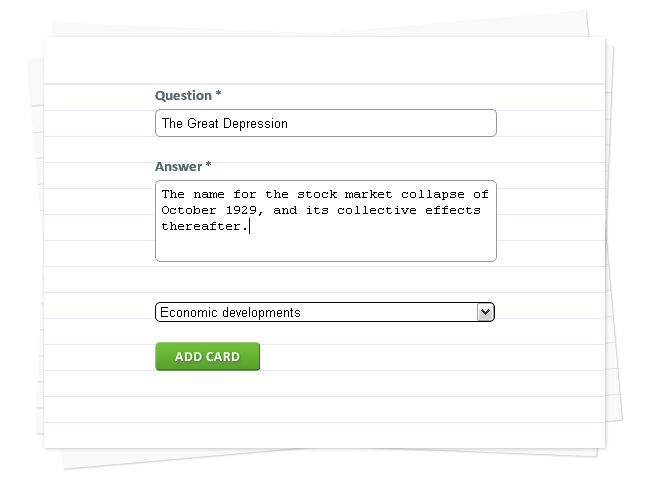 Q: How do I create my own flashcards? A: To begin, click the Study Now link next to the subject you would like to review. Once you're in the flashcard system, choose CREATE A FLASHCARD from the menu in the upper right of your screen. Q: My access code isn't working. What should I do? A: For issues related to access codes, please contact our Customer Support team at 833-639-8640, email us at studycenter@rea.com. We'll resolve your issue within 24 hours on weekdays, or on the next business day on weekends. Q: My flashcard deck says I have zero cards. What should I do? A: This indicates that you have reviewed all cards in your deck at least once. To review your flashcards again, click the CREATE YOUR DECK link in the upper right of your screen. From here, click the All Topics checkbox, and then click Start Studying. This will add all cards back into your deck.